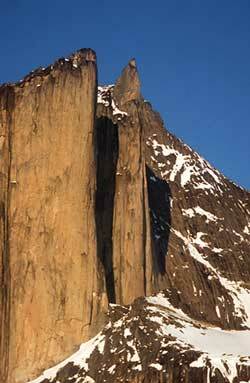 Big wall climbing Greenland style: the central and right-hand pillars of Mt. Nalumasortoq. The new route set up by the Italian/French expedition takes a line up the middle of the righthand pillar. There was just one left. The third pillar. The highest. And to put an end to it, the Greenland 2000 expedition left for the Tasermiut Fjord in the extreme south of Greenland to climb a fantastic big wall, the spectacular West Face of Mount Nalumasortoq's Third Pillar. Greenland 2000 was composed of Jerome Arpin, (a 26 year-old Mountain Guide from Chamonix - Vibram Team), Mario Manica (a 37 year-old mountaineering instructor from Rovereto, Italy - Team Camp & Team Mello's), Giancarlo Ruffino (a 36 year-old, from Varese, Italy and member of the Italian Alpine Academy) and Francesco Vaudo (a 28 year-old aspiring Mountain Guide from Verbania, Italy - Vibram Team). In 1995 a British expedition made the first ascent of the left-hand pillar. A year later the Greenland veteran Christian Dialphin led an expedition that successfully climbed the second pillar. The Welsh duo Nigel Shepherd and Ian Wilson attempted the third pillar that same year, but were forced to retreat after 6 pitches due to an accident.